An important voice for social justice in twentieth-century Philadelphia, Cecil B. Moore served as president of the local NAACP from 1963 to 1967. During Moore’s tenure he placed special focus on gaining access for African Americans in the building trades. 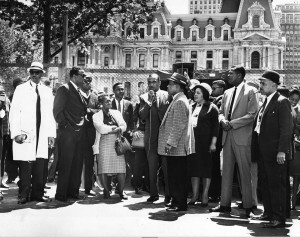 Here in May 1963, Moore (center, holding microphone) speaks outside City Hall during a protest over access to building jobs. Protesters gather outside of a school construction site at Thirty-First and Dauphin Streets in Philadelphia’s Strawberry Mansion neighborhood in May 1963. Neighborhood residents joined with civil rights activists to draw attention to discriminatory hiring practices in the building trades and demand inclusion of African Americans. Even as it underwent a painful process of economic restructuring in the years after World War II, Philadelphia garnered national attention from efforts to integrate historically white building trades. Dubbed the “Philadelphia Plan,” the program requiring federal contractors to practice nondiscrimination in hiring tested the liberal coalition formed in the aftermath of the New Deal in Philadelphia and nationally. Starting in the early 1960s, in reaction to civil rights campaigns in Philadelphia and elsewhere, the federal government used the wedge of contracting to require companies seeking its business to take affirmative action to assure the inclusion of African Americans among its employees. Monitored by the Office of Federal Contract Compliance, the policy took a new turn during the Johnson administration by targeting construction trades in key metropolitan areas for compliance, starting with St. Louis in 1966 and extending to Philadelphia the following year. In adopting numerical goals for compliance, these area plans attracted the attention of U.S. Comptroller Elmer Staats (1914-2011), who ruled in 1967 that the approach violated Title VII of the Civil Rights Act of 1964, which in prohibiting discrimination in hiring explicitly prohibited racial quotas. Caught up in a difficult election campaign, the Johnson administration did not challenge the ruling. Not to be deterred, rights activists in Philadelphia worked with the city’s Commission on Human Relations under the leadership of its chair, Clarence Farmer (1915-2014), to adopt a localized version of the federal program, going beyond it, however, by requiring companies doing business with the city to “hire and train hard-core unemployed persons so that they may become an integral part of his workforce.” It covered not just the construction industry but all suppliers doing business with the city. Despite its pursuit of a strategy to enlist southern states into the Republican fold, the Nixon administration revived the targeted area approach to affirmative action, choosing to promote a “revised Philadelphia Plan” in June 1969. With the First Bank of the United States as a backdrop, Assistant Labor Secretary Arthur Fletcher (1924-2005), perhaps the administration’s most prominent African American, announced an approach that skirted the prohibition against quotas by setting minimum targets to be achieved through good faith efforts in hiring. 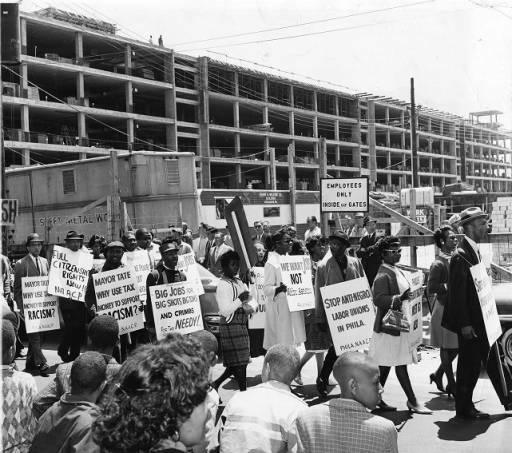 The program, which was quickly extended to other metropolitan areas, was partly intended to draw the support of African Americans to the administration and partly an effort to drive a wedge between blacks and their allies in the labor movement. 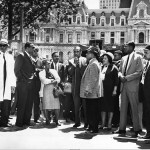 Implementation of the Philadelphia plan produced modest gains for blacks in the building trades, but it generated heated resistance from union leaders in Philadelphia and elsewhere. 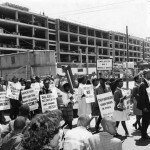 Formation of a local chapter of the Urban Coalition helped rally support for affirmative action in the city, but much of the white working class, facing a threat to their livelihood as the blue collar workforce continued to shrink, revolted. As Nixon perceived the political opening that the clash over employment presented, he moderated his support for affirmative action, leaving in place, however, precedents that continue to govern national as well as local programs. Howard Gillette is Professor Emeritus of History at Rutgers-Camden and co-editor of the Encyclopedia of Greater Philadelphia. Guian A. McKee, The Problem of Jobs: Liberalism, Race, and Deindustrialization in Philadelphia (Chicago: University of Chicago Press, 2008). John David Skrentny, The Ironies of Affirmative Action: Politics, Culture, and Justice in America (Chicago: University of Chicago Press, 1996). Thomas J. Sugrue, “Affirmative Action from Below: Civil Rights, the Building Trades, and the Politics of Racial Equality in the Urban North, 1945-1969,” Journal of Urban History 91 (June 2004): 145-73.